Your feet rarely get the credit they deserve for the massive role they play in allowing you to do what you do in life. But, it pays to reward them with a spa treatment now and again because foot spas benefit your entire body. In this article, we’ll cover the benefits of using foot spas and what to look for in a great foot spa. Plus, we’ll weigh the pros and cons of 7 top foot spas out there to help you navigate through the different features various types of foot spas offer. A foot spa is a product that allows you to get a spa treatment from the convenience of your home. It involves soaking your feet in a warm bath with either water alone or water with salts, essential oils or other natural ingredients that enhance the bath and provide health benefits. Foot spas also massage your feet to relieve pain and stiffness while promoting relaxation. Finally, they prepare you for a good pedicure by scrubbing and cleaning your feet. Foot spas are far off from just placing your feet in a bucket of warm water. 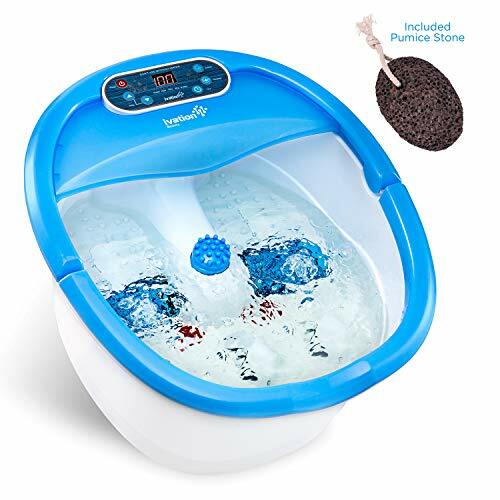 They’re able to heat the water and maintain a constant temperature, create soothing bubbles in the water and massage your feet with rollers and other features. Whether you work long hours on your feet, suffer from arthritis pain, play a sport or need a way to help you relax, virtually anyone can benefit from a foot spa. What are the Benefits of Foot Spas? Using a foot spa provides beauty and health benefits, and when you add essential oils into the mix, the benefits become even greater. The heat and massage elements in a foot spa boost blood flow in your feet. This improves circulation throughout your body, as foot circulation plays a key role in getting adequate blood flow to the rest of your body. By boosting circulation and massaging the muscle tissue in your feet, foot spas help detox your body. By massaging your feet, foot spas also give you the benefits of reflexology, including the stimulation of vital organs that play a role in detoxifying your body. When bath salts such as Epsom Salt is added to your foot spa, the detoxifying effect is even greater. Foot reflexology is used to relieve pain in other parts of the body, so it could help with headaches, back pain or other pains you’re experiencing. It also relieves foot and ankle pain with the heat and massaging. By reducing inflammation and boosting circulation, foot spas help your feet recover quicker from tough workouts or strenuous activities. This recovery is key to injury prevention and preventing muscle soreness. Gravity requires your heart to pump harder to bring the blood back up from your feet. Improving circulation in your feet with a foot spa has the effect of lowering blood pressure because our heart doesn’t have to work as hard to circulate blood. Edema, or fluid retention, is common in the feet or ankles, especially in pregnant women. However, many people have mild edema from excess salt consumption. Foot massages help release this excess fluid to prevent more serious conditions edema can cause. Regular use of a foot spa can help your feet recover from calluses, corns, bunions and other foot problems. 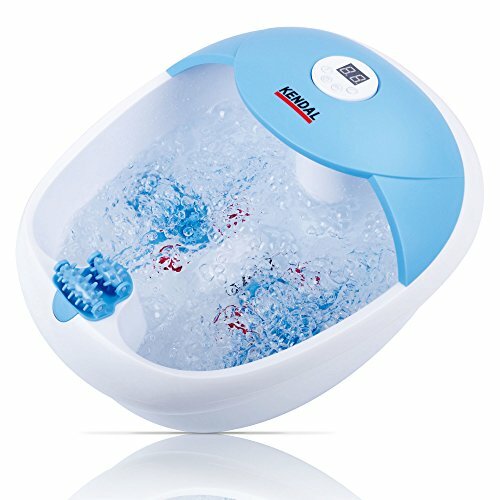 When buying a foot spa there are a number of features you’ll want to look out for. In this section, we’ll take a look at some of the most important ones. Tired, aching or sore feet need oxygen to recover. The whole point of boosting circulation is to increase oxygenation. Oxygen bubbles help deliver this oxygen in a foot bath and add to the healing benefits of massage and heat for maximal rejuvenation and pain relief. While some foot baths only have the option for “warm” or “hot,” the best ones let you input the exact temperature you desire so it can maintain it for you. This preciseness helps you get maximum comfort and relaxation from your foot spa. A good foot spa has good massage features, including rollers that knead the muscles in your feet. Some even have a vibration option, which is great for relaxing and boosting circulation. Some foot spas come with additional tools you can use for a pedicure spa treatment, such as pumice stones and cleaning brushes to exfoliate and soften your feet. In this section, we’ll take a look at some of the best foot spas on the market to help relax your feet effectively. The Ivation foot spa is a little more on the expensive side, but it has the features to justify its price. First of all, it gives you digital adjustable temperature control so you can set the water temperature to the perfect comfort level. It also provides intense massage features, including vibration and motorized shiatsu rollers for deep tissue massage. It comes with 3 pedicure add-ons, including a pumice stone, acupressure tool and foot brush. The huge advantage of this foot spa is its high-quality massage features. 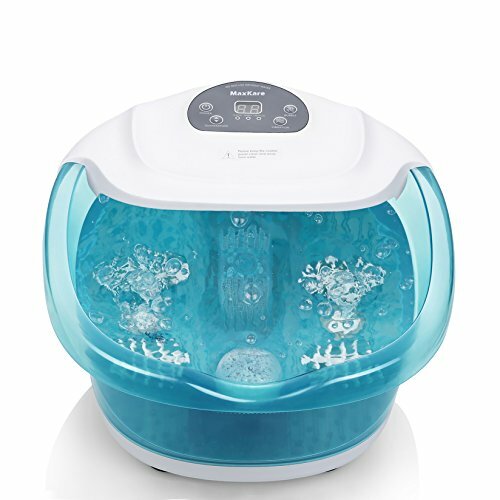 Whereas many foot baths require you to move your feet along rollers, the motorized massagers in this bath do all the work for you and provide a high-intensity level for penetrating muscle tissue. If getting a quality foot massage is important to you in a foot spa, the Ivation Foot Spa is probably your best choice. The HoMedics Foot Salon Pro has 4 pressure-node rollers, but unlike the Ivation foot spa, these aren’t motorized, so you have to run your feet over them. It only has one temperature setting (98 degrees), so you don’t have another option if that isn’t comfortable for you. 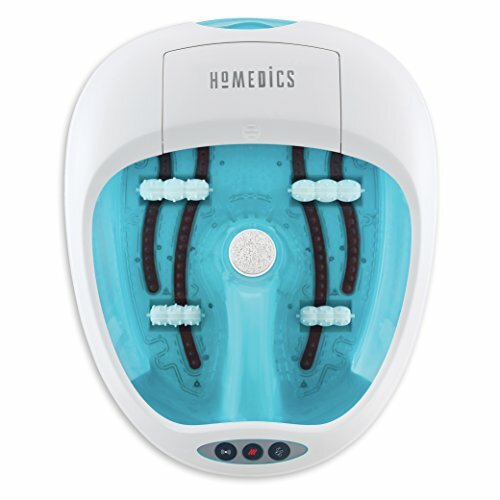 In spite of costing just a little bit less than the Ivation foot spa, the HoMedics Foot Salon Pro doesn’t offer near as much as a therapeutic massage tool. But if getting a good pedicure is your thing, it may work well for you. It comes with 4 pedicure spa attachments, including rough and smooth pumice stones, a cleansing brush and a massage roller. It also has a splash guard to help minimize mess-making. The Kendal all-in-one foot spa massager has massage rollers, which aren’t motorized but are designed to stimulate your meridian channels. Plus, it offers a vibration option so you can get a gentle massage without putting any effort in. It also has 2 modes of bubbles, which provide a gentle massage as well. You have a few temperature options to choose from, but you can’t set the exact temperature you want. It’s built with durable materials that could last you longer and keep you safer. A unique feature of the Kendal foot spa is its red lights inside the bath. Red light therapy is said to promote relaxation, improve circulation and treat skin issues such as scars and wrinkles. 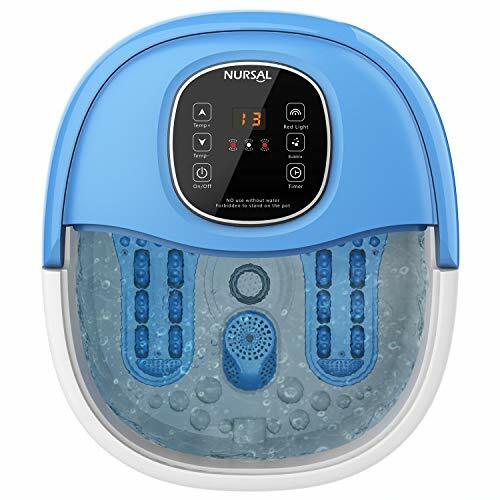 You can set your exact desired temperature with the Nursal foot spa, as long as it’s between 95 and 118 degrees. It offers 11 mini massage rollers (not motorized) for kneading your feet, whereas most foot spas have 2 massage rollers. Like the Kendal foot spa, the Nursal foot spa also offers red light therapy. It has a timer you can set for anywhere between 10 and 60 minutes so you can relax for your desired time without checking the clock. Though it does have a bubble feature, the jets are weak and only located in the centre of the foot bath, so if water agitation is important to you, you could do better with another foot bath. 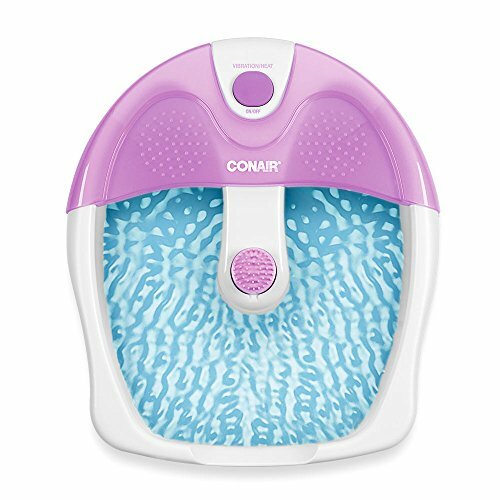 The Conair foot and pedicure spa is by far the most economical choice on this list, as it costs a lot less than most foot spas. On the downside, it lacks an oxygen bubble feature altogether, so there’s no water agitation or soothing jets. Also, it doesn’t heat up the water for you. It’s only able to maintain the temperature of the water you put in the foot bath, so there’s a little more work involved for you. It does have a small massage attachment, but you can only use it on one foot at a time. The other massage feature it offers is vibration. This Kendal foot spa is the priciest one on this list. Its downsides are that it takes around 10 minutes for the water to heat up. Unfortunately, the basin is more shallow and there’s no splash guards to prevent a mess. Also, the bubble jets are quite loud compared to other foot spas. At the bottom of the basin, there are massage nodes for each foot, but they don’t roll. There are 2 massage rollers outside of the basin on the rim, so you can’t use them while your feet are soaking. While the features don’t necessarily justify the price, the durability of this foot spa does because it’s made with high-quality materials that are built to last. 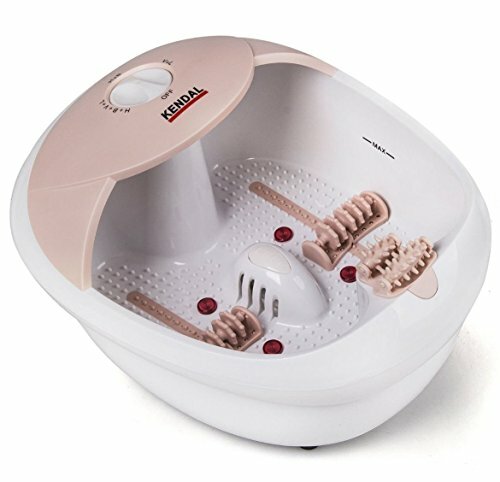 The MaxKare foot bath gives you an all-in-one spa treatment for your feet, with bubbles, vibration and water heating. The water heats to the temperature you set between 95 and 118 degrees. The MaxKare spa also features 4 massage rollers with acupressure nodes for massaging the soles of your feet. Although this massager is a little less pricey than most, the jets and vibration features are very low-intensity. If water agitation and a soothing vibration are important for you, then you may want to pay a little more for a Kendal or Ivation foot spa. The best foot spa we can find is the Ivation foot spa because it meets the mark in so many different categories. It provides deep tissue massage with motorized shiatsu massage rollers for deep tissue kneading. It also produces oxygenating bubbles, has a vibration feature and keeps the temperature set to the exact degree you want it. Though it costs a little more, you get 3 pedicure add-ons, which makes it more economical. Plus, you get all the bells and whistles of a good foot spa to get the most bang for your buck. Foot spas can be a bit of a mess, but you can keep things tidy with a few smart tips. Only use your foot spa on the floor, over a protective mat that can absorb any splashed water. Keep a towel on hand to dry your feet when you take them out. Also, foot spas can be a risk for infections, so you want to clean them regularly. Avoid using your foot bath when you have any cut, scrape or open sore on your feet. It’s hard not to love a good foot massage and spa treatment, which is why it’s great to have your own spa equipment at home. Your feet support the weight of your entire body while having to pump blood back up to your heart. Foot baths with massage are a fantastic way to care for your feet and improve your overall health while letting yourself relax and unwind at the same time.